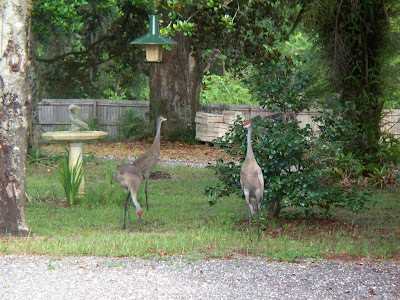 I poured a bunch of seed out under the birdfeeder on Saturday. Today, we had an early morning visit. I tried a video but I apologize for the shakiness........early morning low blood sugar is my guess! I started this new idea today.......... 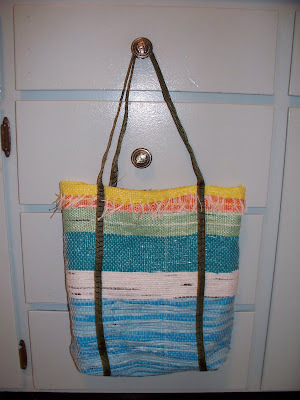 I saw a tote made out of plastic grocery bags quite about 8 weeks ago and tucked the idea away until today! 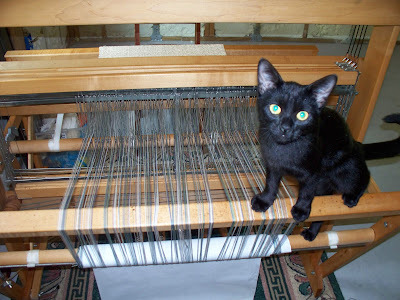 After struggling all day yesterday to salvage an old warp that came with my loom I got it untangled and on the loom. 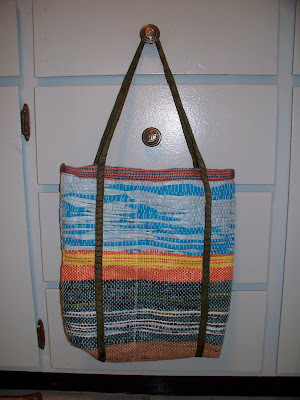 I have been cutting up the bags for a few weeks so I was ready to weave them today. 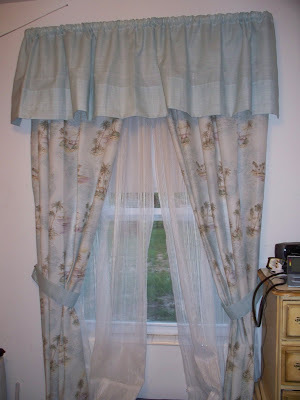 ( I even 'clepped a few from Caleb's and Marsel's when I was nursemaid at their homes. I really miss the pretty blue ones from WalMart but did find one at my daughter's and a nice blue one from FinishLine that Caleb contributed!) 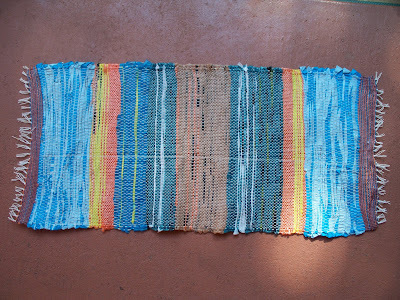 The weaving rhythm was a bit different with the plastic 'fiber' but I caught on after a bit. 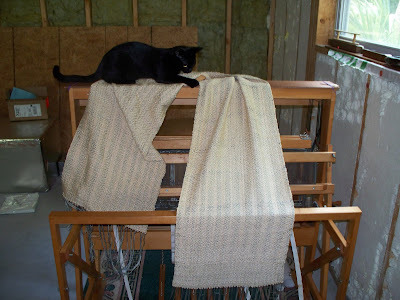 I was able to weave two tote bags on this one warp. 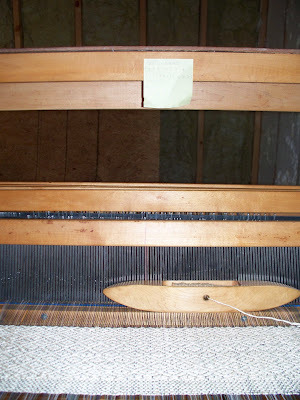 Since it takes as long to warp as it does to do the actual weaving you can see the sense in this! 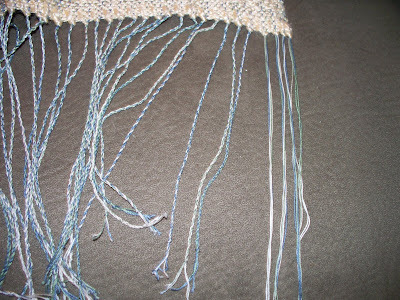 And yes, that line in the fabric-it is where I put two warp threads through one slot in the reed but I didn't see it until I was ready to weave and since it was in the middle I could not fix it unless I redid 60+ heddles........and that was not going to happen. Trust me, it is a design feature! The orange comes from the PennySaver that is tossed on the end of our driveway each week, the green is from the produce at our grocery store, the yellow is from SaveALot, white from the new ones at WalMart, the light blue is from the Chilren's Place store..........fun to see the different ones-kind of like finding fabric you recognize in Grandma's quilt! and sewed them into these two tote bags! After sewing the first one with the fringe on the inside, I decided to let it show on the second and really like the way it looks. The bags are really softer than you would think and yet hold their shape nicely! Success! I have one more rescue warp that I will use to make another two bags! 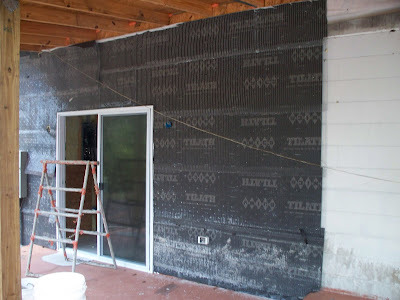 As I began the weaving (cleaning, cooking and etc) the stucco men began their work, too. 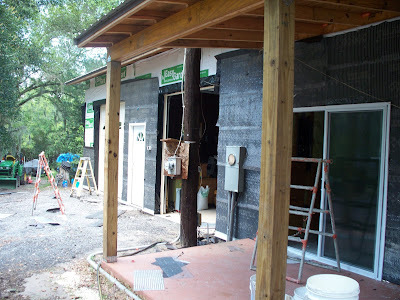 They nailed up screen over black plastic and so entombed the whole new construction of our home! 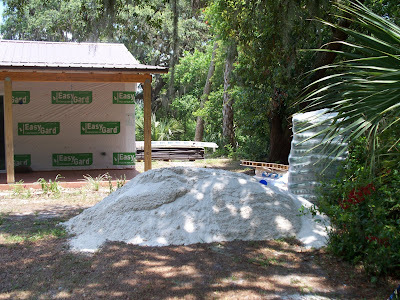 They work quickly and efficiently and have most of the house prepped like this by this evening. 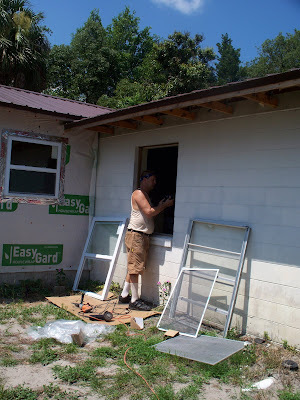 Bill started in taking the old single pain, aluminum framed window out of the bedroom in the original part of the house. See how much better the new one looks? 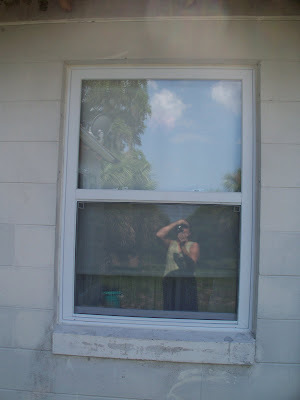 (Yup, that's me reflected in the pic!) 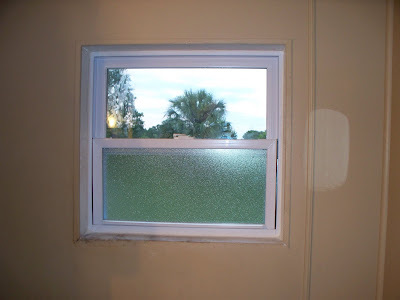 The new thermal window immediately reduced the heat of the eastern sun shining in the room! After a lunch break (waldorf chicken sandwich in a wrap!) 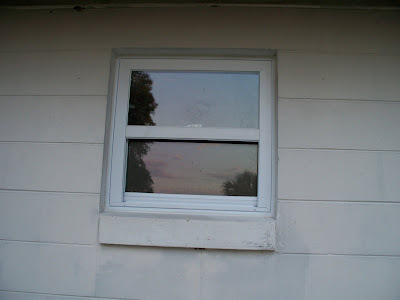 which gave a welcome break from the heat (95 F) , it was on to the bathroom window. I got the clean-up duties and put the rooms back in order drill--what a joy to complete this job! Thanks to God for protecting Bill when the window shattered upon its removal-he only got a few tiny shards with just a few drops of blood. 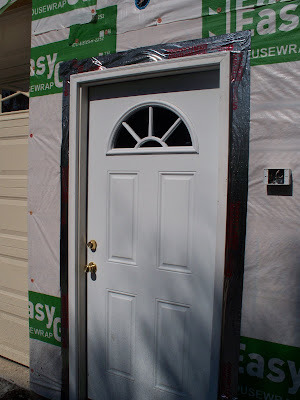 Renovations are not for cowards! 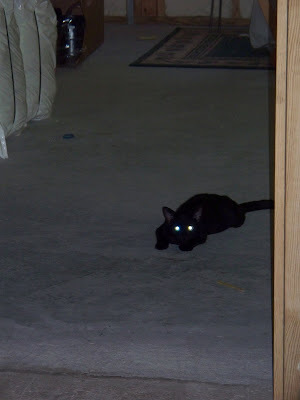 ..............just waiting for me to throw the mousie so she can retrieve it and bring it back to me for another throw! For hours.....and hours! I am a Floor Loom Weaver! 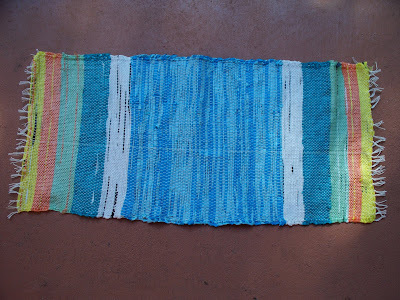 I pulled the shawl off the loom after hemstitching the other end! It is beautiful in all its beginner glory. 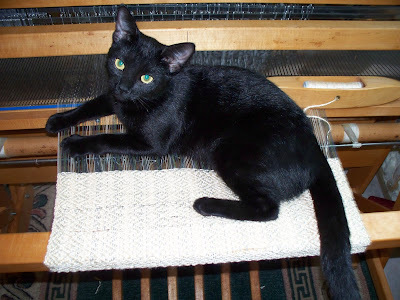 Nyki was helpful to the very end.........she liked it when I was doing the hemstitching because she wasn't getting spanked for jamming up the shafts during weaving! 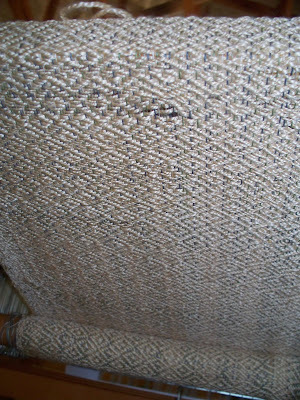 Here is a close-up of the weave structure. It is called a Bird's Eye twill from the book A handweavers's Pattern Book by Marguerite Porter Davison (pg 20 , pattern IV) for four shaft looms. The color variations of the warp gave just the right shading I envisioned! The weight and length are perfect to wrap around! 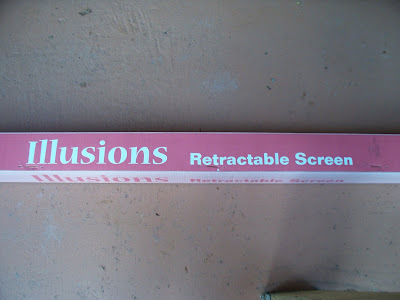 ( 7' long and 18" wide! not counting the fringe which is 6" at each end) See the ownership battle being waged?! 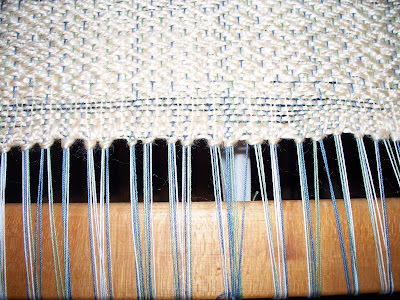 I think this will conclude the weaving with Soysilk for a number of reasons......on the positive, the sheen and drape are excellent but the negative is that the silk is slippery against the warp and shifts too easily which means that it catches easily and will need constant 'fixing' when it is worn. Over all I am pleased with the experiment though. 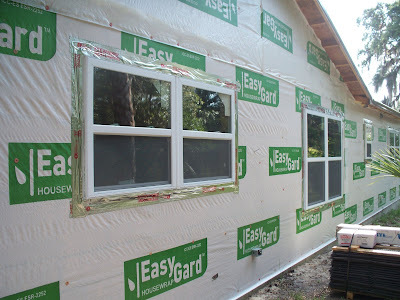 Bill put the foil tar tape around each of the windows and doors around the house-another part of the 'hurricane-proofing' code. 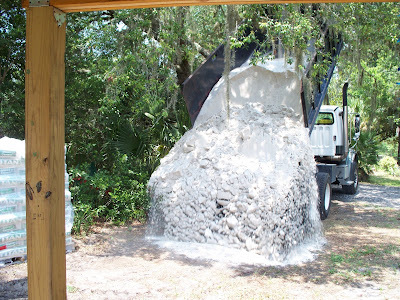 Bring on the stucco crew! 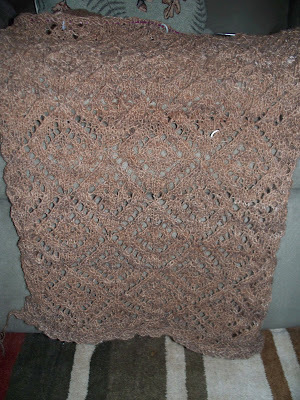 I am knitting away on the alpaca shawl......... about 27" long so far. Nyki has left her mark on this weaving! 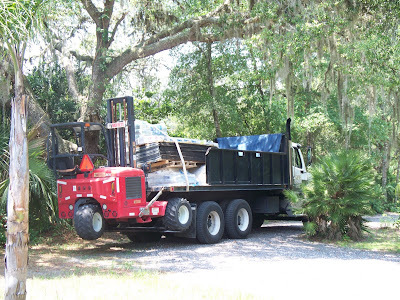 The supplies for the stucco came today! 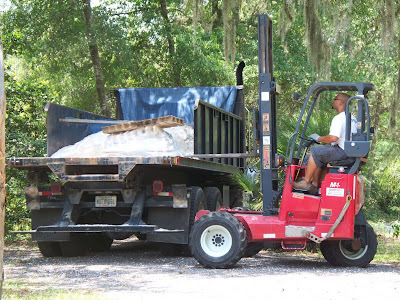 Cement, metal screening, sand are piled in the front yard for easy access. The plan is for work to commence Thursday morning. Bill has quite a bit of work to do to get ready for them but he seems to work better with such deadlines. 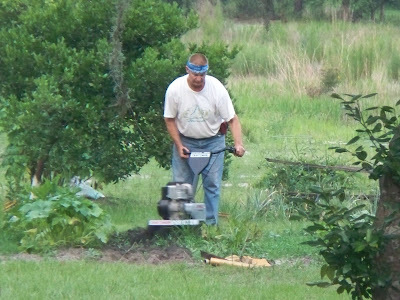 The temps are still in the low 100's so it does make for some interesting stamina work-outs. 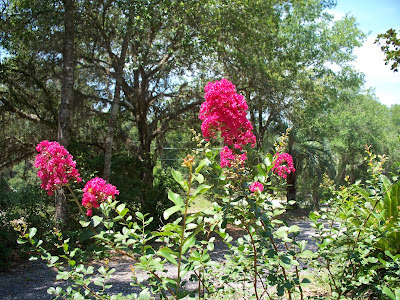 The crepe myrtles are in bloom-letting everyone know that it is summer here. 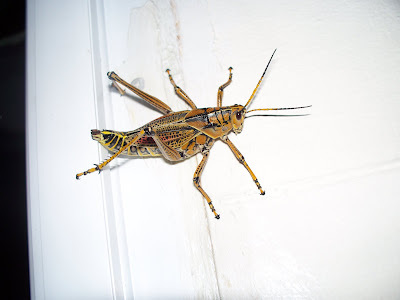 And with summer comes these nuisances.....they are 4" long! 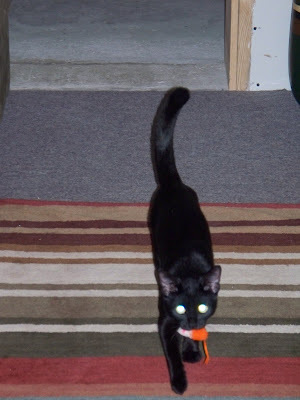 Bling, who loves to chase the normal sized grasshoppers doesn't mess with these guys! 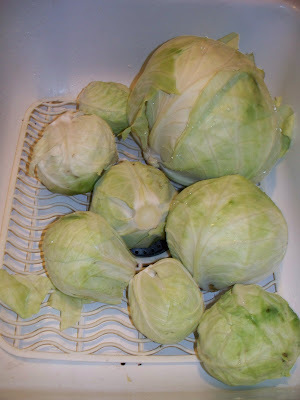 Even our neighbor's chickens won't eat these things! They do not linger here too long gratefully! 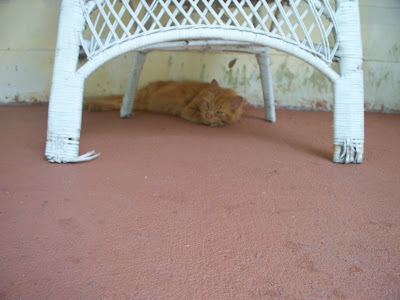 Bling is in full summer mode-early morning and late evening hunting-sleep during the day. Bill enjoys a birthday today. 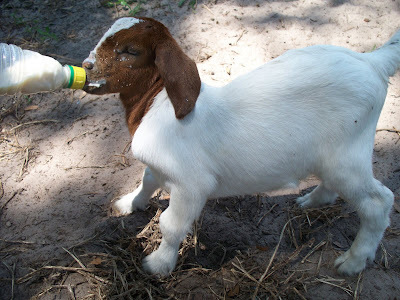 To celebrate we will babysit some newborn twin goats for our neighbors who have medical appointments today, hang out for a delivery of all the stucco supplies-yes, the stucco work will begin this week! And we will take a siesta this afternoon as temps reach 100 again today! 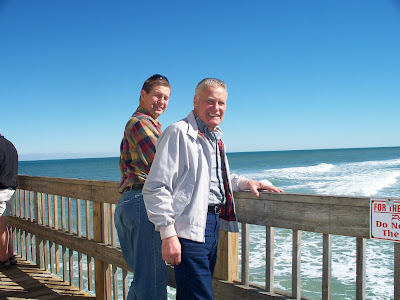 Dinner will be a home cooked meal......Bill has his heart set on an all you can eat seafood buffet in Orlando that he heard about but is saving the date until I am feeling better-thank you. 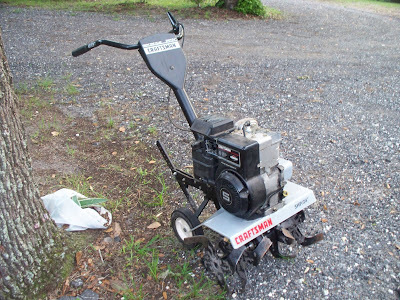 Bill did buy a used garden cultivator as his old one finally died. 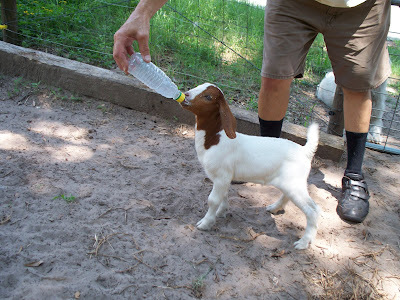 He put it right to use in the garden and was pleased with his purchase! 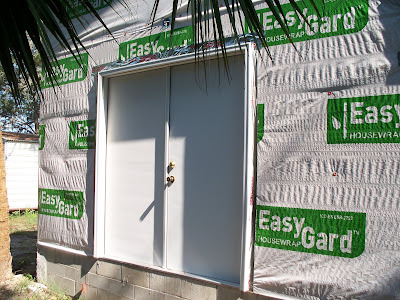 Our retractable screen door finally came in-it has been on special order since April! The list has peaked for to-do's to get ready for the stucco work and Caleb called and asked to go out on the boat this week on his day off because he bought some used water skis at a garage sale and wants to try them out! Never boring! 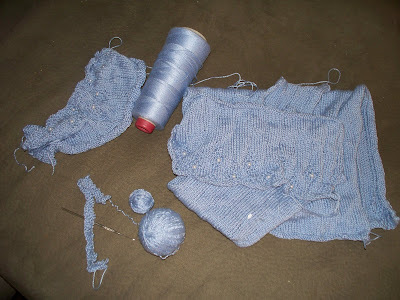 I ripped out an old sweater that I had begun 7 years ago-all the parts were there but it turned out too small and I never sewed it together. Since I could put the yarn (#5 pearl cotton) to good use in the weaving realm, I ripped it all out and have reassigned it-I can just see it as warp in my first Jeans rug! Have a great time at Bob and Shelly's today, Dad. Looking forward to our next visit. We love you. 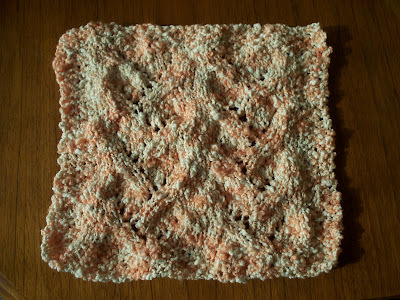 I wove a bit on my SoySilk (soysilk is a by-product of Soy and has the look and feel of silk) for the shawl...........I even made a mistake, recognized and fixed it! Always a good sign when learning a new skill. 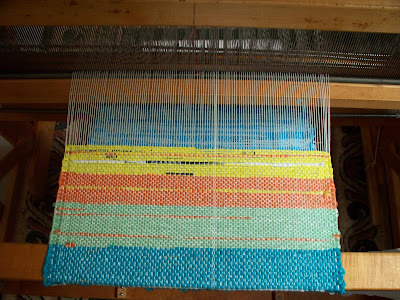 I have found that this pattern has to be watched for there are sections that require an extra wrap around the selvage warp that would get missed if I just wove it without watching......I have read about floating warps but do not know yet how to encorporate them into my work. 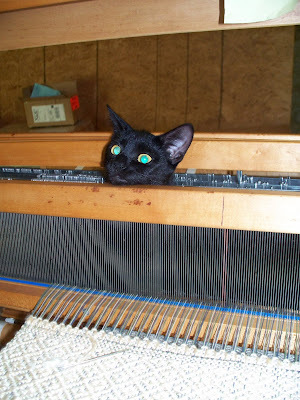 As it is now, I just watch and make the appropriate adjustments to my weaving song. It is good. Nyki has moved her boredom (or irritation because I keep chasing her off my weaving) to a new activity-chewing up paper-patterns, bills and toilet paper all qualify for her attentions. 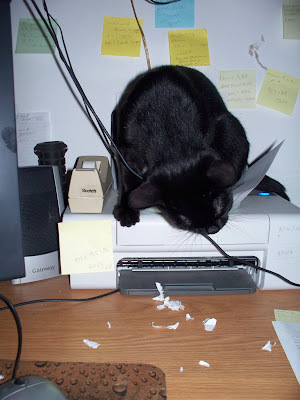 Glad it is just the paper and not the wire that has her attention! I made the first on out of a thin white cotton boucle on # 6 needles and finished it in one evening. The second one is out of a heavier cotton boucle and I made this on #8 needles. 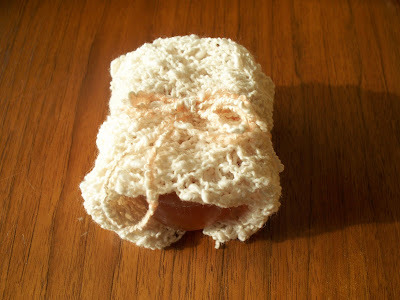 Nice to have a project I can wrap my mucous-filled brain around----sorry if that is too TMI for you! 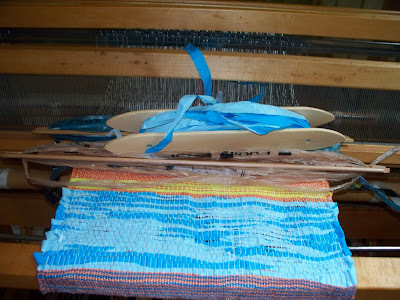 I worked forever but I finally finished the warping of the loom for the soysilk shawl! I did need to lock Nyki away for a while because her help almost sabotaged the whole threading of the heddles but I managed it eventually! 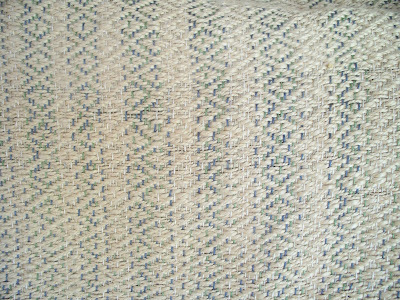 I worked an inch of plain weave and executed my first row of hemstitching. 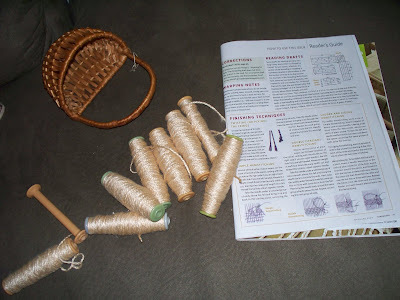 A thanks to my handy copy of Handwoven magazine. 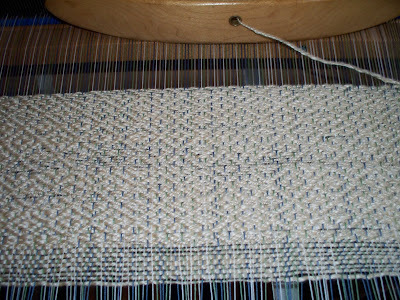 Then I began my actual weaving. It works! Talk about the love of numbers........see the post it note? It has my key for treadling the pattern-4-3-2-3-4-1-4-3-2-1-2-3-4. 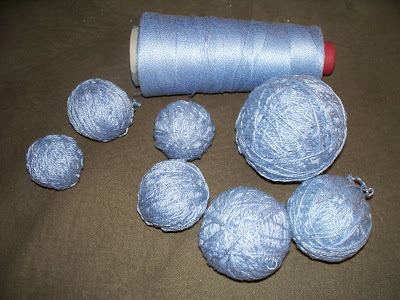 My daughter and I talk about our OCD's when it comes to numbers-if you really suffer from this syndrome, my apologies, but numbers do have a calming affect on us and at the same time they do try to rule.........knitting has always give this an outlet and now I find, weaving, gives them a voice, too, and it made me smile as I wove and thought about it! See the diamonds? See the shine? 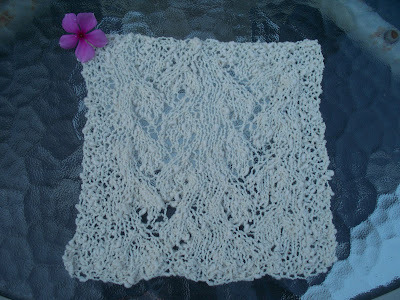 The soysilk is slippery and does have some more draw in than the wool or cotton I have used but it is giving me just the look I imagined when I conceived this shawl. Yippee! One Eye Done, One to Go!